After President Roosevelt’s death, President Truman replaced the presidential plane with a C-118 Liftmaster that he named “Independence” after his home town of Independence, Missouri. This aircraft was the first true Air Force One and it bore the image of a bald eagle on its nosecone. President Eisenhower then designated two planes for his official use. Both C-121 Constellations, they were named “Columbine One” and “Columbine Two.” Eisenhower was also the first president to use the official secret service call sign, “Air Force One,” a development made necessary by a near mid-air collision with an Eastern Airlines plane that happened to be using the same civilian designation (8610) as the president’s plane. Near the end of the Eisenhower presidency, the Air Force introduced jets to the presidential fleet for the first time when it acquired three Boeing 707’s. The history of Air Force One continues with President Kennedy who was the first president to travel exclusively by jet. He was also the person responsible for introducing the term “Air Force One” into the American vernacular. Kennedy liked the term so much that he told his staff and the White House press corps to make the reference known to the public. Also, the Air Force One color scheme of white, silver, gold, and several shades of blue, was selected by former first lady Jacqueline Kennedy. The Boeing 707 used by Kennedy, SAM 26000, flew the president to Berlin for his famous “Ich bin ein Berliner” speech, and it ferried him to Dallas on that fateful day in 1963. That same day, Lyndon Johnson took the oath of office on SAM 26000, becoming our nation’s 36th president. SAM 26000 also flew President Nixon to his famous meeting in China, and it carried Secretary of State Henry Kissinger to the peace talks that would end the Vietnam War. SAM 26000 was replaced by another 707, SAM 27000 in the summer of 1972. This jet would become the most famous in the world and it is the subject of this project. SAM 27000 was used by seven presidents, although it is most closely associated with President Reagan who flew on the aircraft more than any other president. The history of Air Force One is rich. 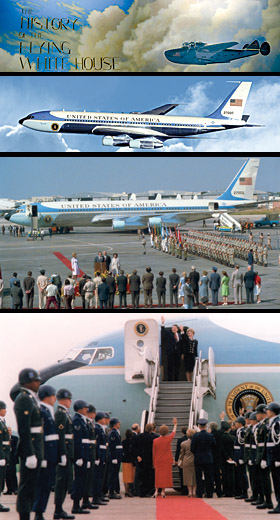 In 1990, two Boeing 747’s—SAM 28000 and SAM 29000—were added to the presidential fleet and are the aircraft used primarily for Presidential travel today.